Leveraging Sections in your app. Sections in Fulcrum can be used to group together related fields in your apps. Using drag-and-drop, you can move your fields around and nest them within sections for better organization and presentation to your field users. In the image below, there are two sections, General and Contact Info. Within each of these sections have fields that pertain to that section nested within them. 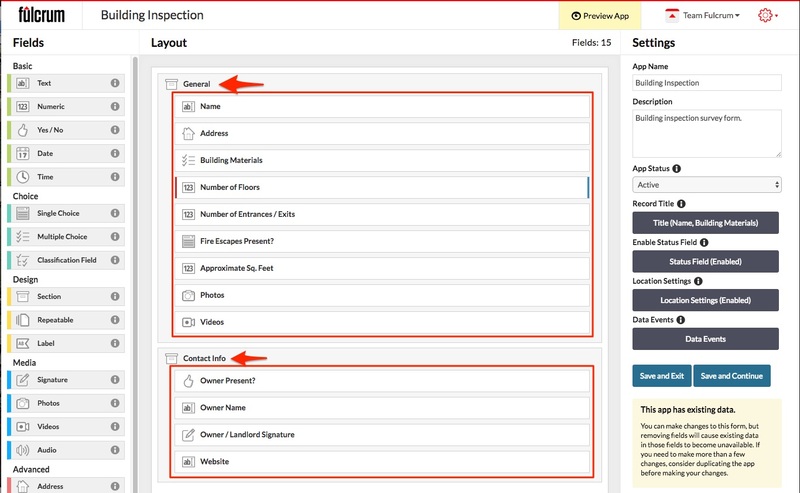 You can configure whether you want your section to be displayed inline or drill down on the mobile apps. The best option here depends upon the desired workflow, but typically simple forms are better with inline sections, and drill down is helpful for more complex apps with multiple levels of nesting. Sections can use conditional logic to dynamically show or hide the entire section of the form based on rules you configure. Sections don’t show up in the resulting data during export or also in the form schemas if using the API. They’re only used for cosmetic display within Fulcrum.